Photo credit: “Men working on transformer,” Thomas Bouckley Collection, Robert McLaughlin Gallery, 1912, TBC 0909. 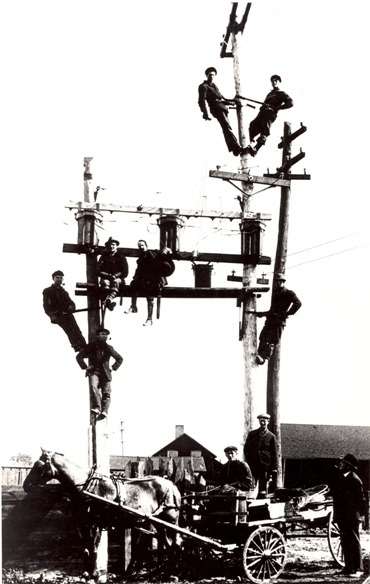 This image was taken in 1912, in an effort to document the erection of hydro lines and telephone lines in Oshawa, Ontario. The description of the photograph reads, “Some men working on power lines and transformers. A horse-drawn wagon with supplies for the workmen is in the foreground of the photo.” Other photos from this series show children gathered to watch the spectacle that this work must have surely posed for local residents . A letter included as part of this collection states that these men worked for the Bell Telephone Company, and traveled to Oshawa from Belleville or Toronto. Posing workers, some with smiles and tobacco pipes, are arranged around the equipment. A horse-drawn wagon in the foreground is a symbolic nod to limits of the technological transformations of the time, where traditional energy realities coexisted amid the rapid industrialization that Oshawa experienced leading up to the Great War. 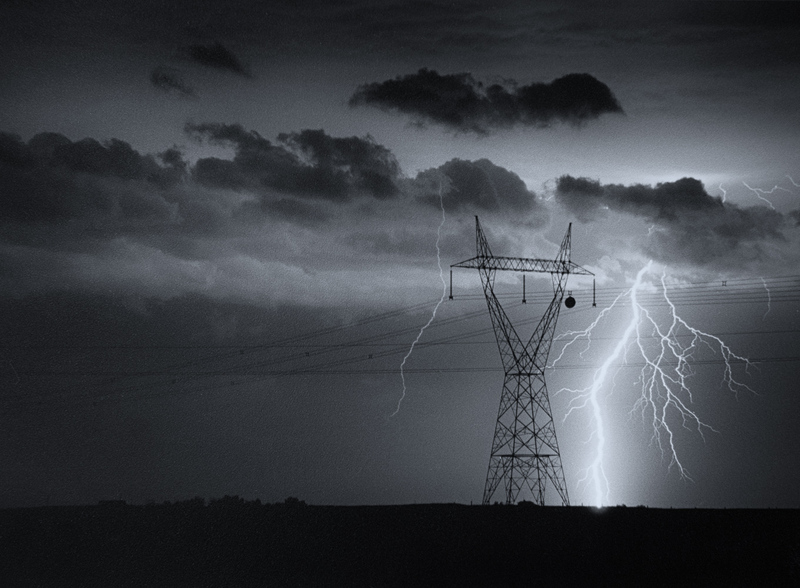 High-voltage electrical lines combined with actual lightning strikes might be clichéd, but is certainly an energy landscape, depicting both the unpredictable nature of the bolts in the sky and the ‘managed’ electrical infrastructure that stretches across the prairie countryside. The tension between what is managed and what is not was reflected in the taking of the photograph. The storm itself was spectacular, but it was not until I saw the tall pylons stretching across the field that I was able to picture this scene. The steel infrastructure was predictable, but the lightning was not. With a camera propped on a bag for stability, I manually held the shutter open, hoping to capture lightning strikes that might just hit the right spot — and preferably not my car. The picture appears to be a single moment, but is in fact a series of strikes over a period of time, between one to three minutes. The electrical infrastructure might make the voltage in the lines manageable, but it is the wild bolts that give the picture its spark. Anonymous, “Maggie Louisa” of Yarmouth, Israel Goudey, Commander, Entering the harbour of Leghorn (1866), McCord Museum, Montreal. This painting – part of a wonderful genre of maritime painting and ship portraits – is a valuable representation of Canada’s energy history. I desire to see her cities grow, her commerce extend, her ports crowded with shipping and manned with the sons of our own soil, many of whom I am proud to say are, at the moment, spreading canvas on every sea, from the cold north to the sunny south and conducting our ships to the ports of the most enlightened and commercial nations of the globe. The Maggie Louisa is shown entering such a port (Livorno, Italy), heeling in a full wind to better to display her seagoing assets to the viewer. While today Yarmouth struggles to maintain its ferry and harbour, in the late nineteenth century it was one of many towns thriving by facing out to sea. 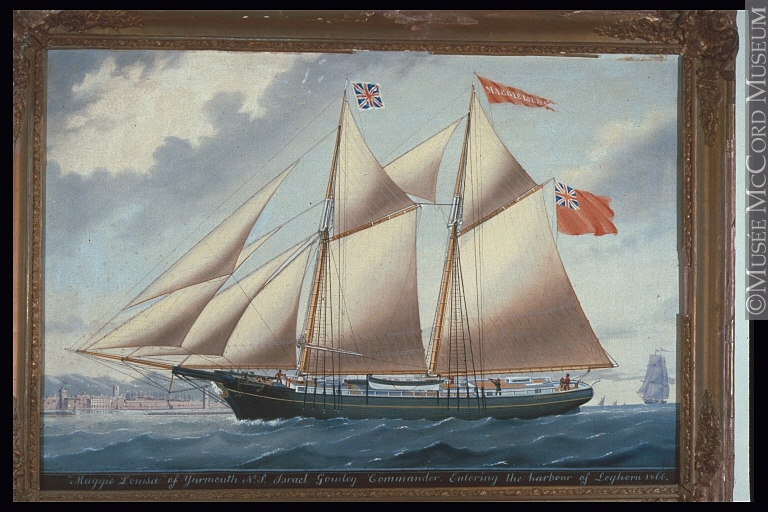 Towns such as Yarmouth, Lunenburg, Shelburne, and Pictou were known internationally for their shipbuilding and import/export trade, and proud of their connections with ports around the world. Like many on the East Coast, Lawrence was opposed to Confederation, fearing (correctly) that the region’s maritime economy and orientation would be overshadowed by the industrial and westward interests of the larger, wealthier Canadas – interests powered by coal rather than wind. While Nova Scotia remains firmly invested in oil and gas (leasing two billion dollars’ worth of exploration parcels offshore since 2012), it is also touting its renewable energies, in both wind and tide. Despite Lawrence’s fears, the age of sail – and its sense of Maritime difference – remains at the core of regional identity, thanks in part to the nostalgic, romantic, but also definitively triumphant memory of one particular fishing schooner now on the Canadian dime. It may help to remind Maritimers of their long history with these “alternative” energies and that indeed, for many decades wind meant wealth. So, I like this painting because it reminds us that a) the nineteenth century wasn’t all about coal, even/especially in Nova Scotia and b) we have options, and have had options in the past. Speech on Nomination Day, 1867, in William D. Lawrence: Nova Scotia Shipbuilder & Anti-Confederation Campaigner: The Complete Archived & Annotated Writings (Kennetcook, NS: Heroes of Hants County Association, 2010), 229. Flying over Alberta, August 2015. I took this photo last summer on a final visit to my parents’ farm in Northern Alberta. 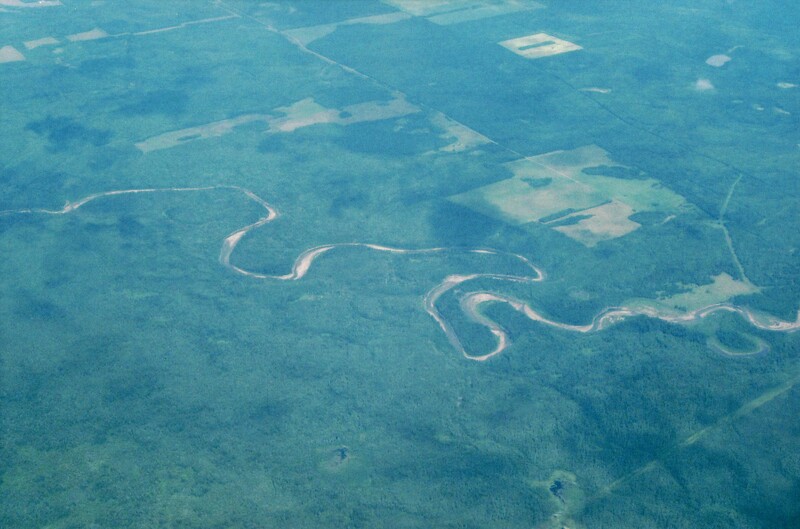 The Smoky and Wapiti Rivers at the edge of the County of Grande Prairie cut through a patchwork of heavy forest and prairie that makes up Alberta’s Peace region. This is a land of sour gas, timber, and agriculture. The riverbeds are full of dinosaur bones and fossils. Sour gas wells are a common sight in this area and from the air the sites often appear as oddly cut patches and lines in the otherwise dense forest. Featured here is the region’s mixture of forest, farmland, and water. It appears at once pristine and functional. A movement away from fossil fuels will definitely change this region, but from the air it is clear that this would not be the first change to the region in the pursuit of Canada’s energy needs. In 1971, Trans Mountain Pipe Line Company published this image in its annual report to shareholders. 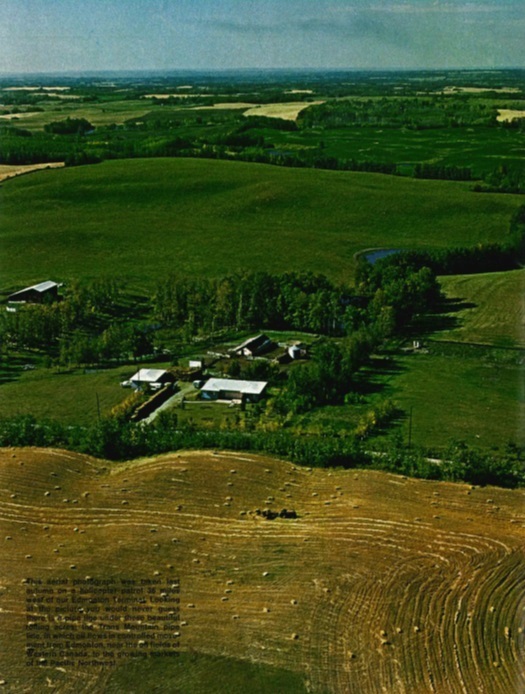 Part of the caption for the image read: “Looking at the picture, you would never guess there is a pipe line under these beautiful rolling acres.” The company regularly published such images in its annual reports, stressing the invisibility of its oil pipeline, in spite of suffering regular oil spills along the right-of-way. Long-distance oil pipelines are an invisible technology, or as Trans Mountain put it, “silent rivers of oil.” They cross under farms, over mountain ranges, and beneath rivers and streams, delivering energy from places of extraction to places of consumption. When they fail, the spills that result reveal the energy landscapes beneath our feet. 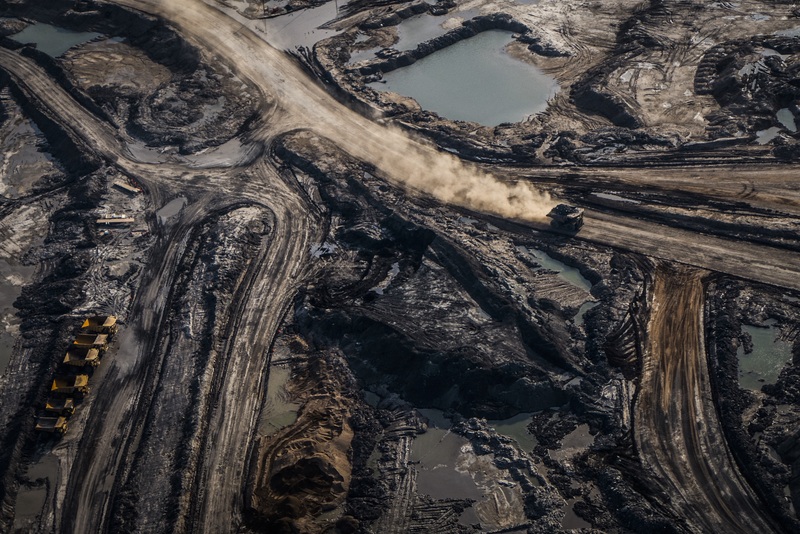 Syncrude Mildred Lake Mine, Athabasca Oil Sands Region, 2014. I took this photo during a flight tour as part of a Treaty 8 conference hosted by Athabasca Chipewyan First Nation. At that conference, and at countless other venues, Indigenous communities have called on government to honour Indigenous rights and renew treaty relationships. Her Majesty the Queen HEREBY AGREES with the said Indians that they shall have right to pursue their usual vocations of hunting, trapping and fishing throughout the tract surrendered… saving and excepting such tracts as may be required or taken up from time to time for settlement, mining, lumbering, trading or other purposes. The current scope and scale of bitumen extraction and industrial development in the Athabasca region seems a drastic departure from what mining would have meant in the nineteenth century context in which Treaty 8 was signed. The recent collapse in oil prices has stifled Alberta’s extractive ambitions in the oil sands and presented a rare moment for Canada to reconsider its relationships with Indigenous peoples and the Athabasca environment that hopefully will not be considered squandered when oil prices rise.